I once had a conversation with a printmaker, some years older than me, whilst we were both invigilating a group show in a gallery somewhere. We were chatting away, as one does, when she made a remark that has stuck with me. She said she wished she’d done more to promote her work and taken advantage of more opportunities. “Too late now” she said. And to be honest I guess it was a bit – she was probably in her late seventies at that time. Anyway, I’ve always remembered that wistfulness in her voice and it’s become one of the things I say to myself, when I need a bit of a kick up the proverbial. Mostly, life as an artist is pretty mundane, routine-driven. You get up, drive to the studio, make some work, send out an order or two, have several cups of tea, chat a lot. Then suddenly a new gallery rings up offering a show, or you’re asked to submit a proposal for a new commission, beyond your current experience. A big opportunity like this can freak you out a little and it might be difficult to manage. Like a small business suddenly getting a big order, there are the logistics of it to consider – producing the work, pricing it suitably, delivering it and invoicing for it. No wonder your brain gets a bit fried and your capacity to cope has a wobble. But seriously, I’ve lost count of the times I’ve heard fellow artists say they can’t do something. Their default position is to dither and prevaricate – they haven’t enough time or experience, it’s too difficult, they’re going on holiday at the end of the month (seriously). It’s easy to feel that a new opportunity might be beyond your capabilities as an artist, to feel overwhelmed. And obviously you don’t want to set yourself up to fail – you have to be realistic as to what you can manage but seriously, what’s the worst that could happen? So you don’t quite get it right and the gallery gets eight new pieces instead of the ten they asked for? Well, doesn’t that just show your work is in demand? And that proposal you’ve sweated over is rejected – it just means it wasn’t right for the client – so what? The point is that if you don’t go for it – if you put up too many obstacles and make too many excuses – you may not get the chance again and you’ll never know if you were able to rise to the challenge or not. So the trick is to try not to panic (this is possibly a bit rich coming from the Queen of Panic here). Just don’t be tempted to retreat back into the safety of the studio carefully avoiding getting involved with that sort of pressure again. That window of opportunity just passes you by – again and again until there are no more opportunities…. So just grab those chances and work out how to do it afterwards. Don’t be one of those artists that we’re all familiar with, the ones who say wistfully ‘I could have been a contender’. I have three Private Views coming up in the week ahead and the first is on tonight. 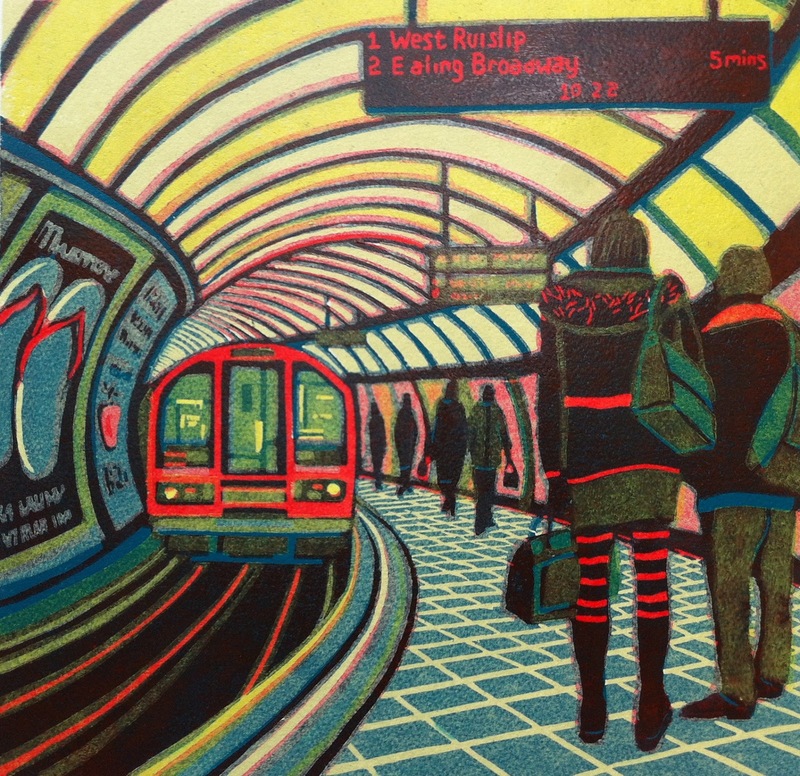 The Royal Society of Painter Printmakers is holding their Annual Exhibition at Bankside Gallery. 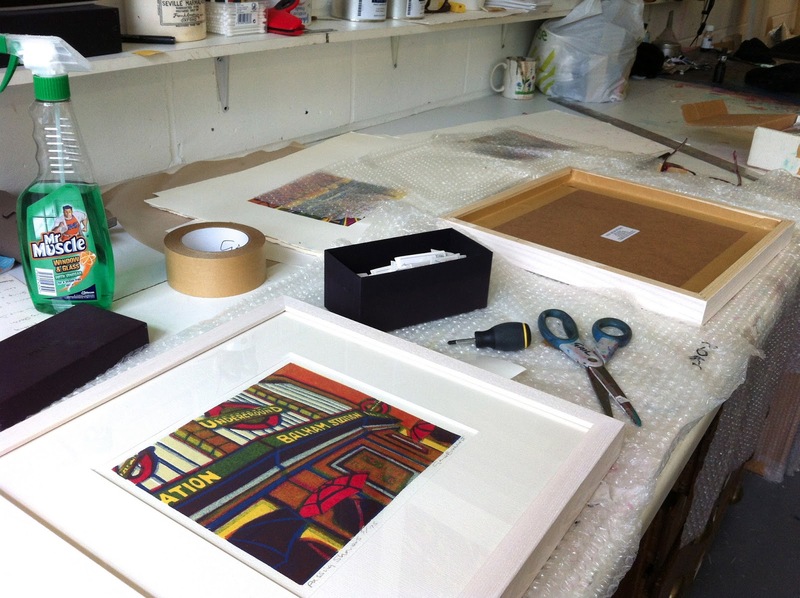 If you fancy looking at interesting prints with a glass of wine, then why not come along? It’s on from 6-8 tonight, right next to Tate Modern. The other two are for a Half Moon Studio group show at the Rectory Gallery in Spitalfields – the first is on next Wednesday – but more on that later. 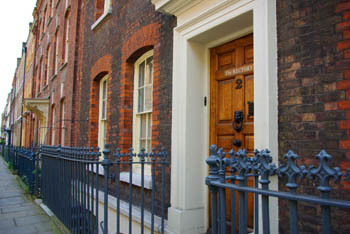 Alas, I have a couple of Private Views to go to in the next couple of weeks, one of mine, and one I’ve been invited to. I always feel I have to go, although I’m not in my element. Then you’re left there looking at the work (which takes 15 mins max) and nursing a warm glass of something which should be cold, all the while trying to look interested and full of admiration. 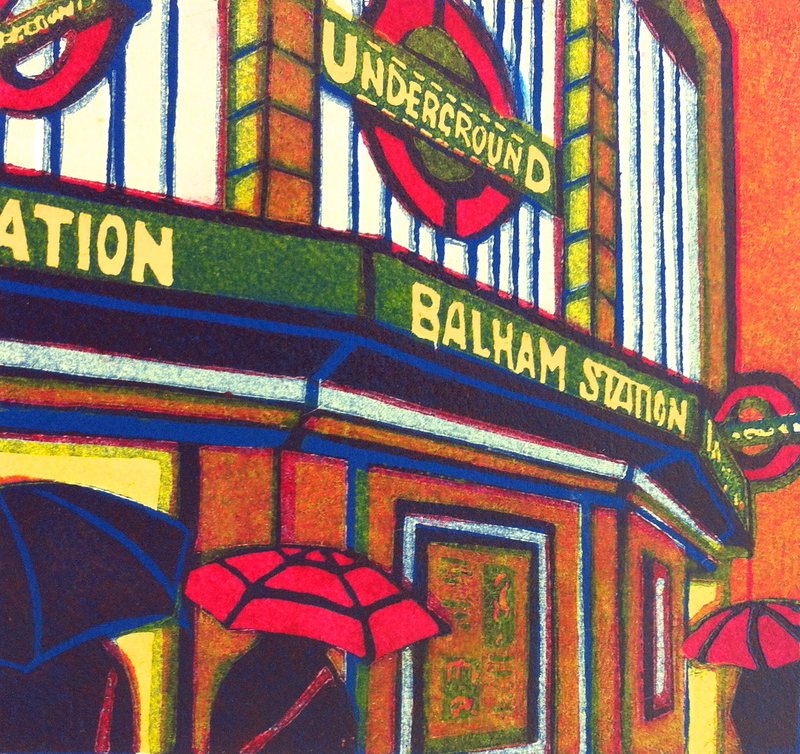 Here is my new linocut of Bank Tube Station – just a snap taken on my phone at the studio – but you get the idea. I wanted to call it Little and Large – but I decided to be sensible and so I settled on Weekend Away….